Growing up in the 80s and 90s there was an abundance of Christmas Beetles each year. 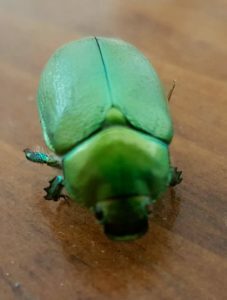 I remember on many occasions my brother and myself having competitions on who could catch the most Christmas beetles, needless to say my little brother would always win as he would forage for hours looking for the christmas beetles. So why don’t we see Christmas Beetles like we use to when we were younger. According to the daily telegraph Christmas Beetles are declining because of climate change. Over the last four springs the climate has been somewhat dry and warm which means that with the ground being so hard the Christmas Beetle larvae is unable to crawl its way out from underneath the soil and therefore resulting in them being defenceless underneath the soil and dying. Another major factor of the Christmas Beetle being on the decline is the removal of the eucalyptus trees as this is their main source of their food diet. The larvae needs to be able to come up through the soil so they can reproduce and carry on their legacy. Something I didn’t know was that according to records that about a century ago the Christmas Beetle was evident in Darling Harbour that they were actually called the Darling Harbour Beetle and that there was such an abundance of them that the tree branches use to hang in the water due to the branches being so heavy with Christmas Beetles. So if you happen to see these little beauties please don’t step on them or kill them rather pick one up and inspect them, see what they look like, see their tiny robust bodies, let your kids pick them up and investigate. Article Inspiration courtesy of the Daily Telegraph.